He not only won one Olympic Gold Medal, but two in men's platform diving in 1948 and 1952. 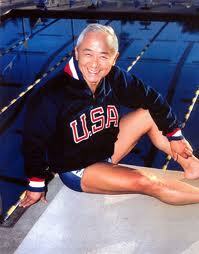 Dr. Sammy Lee also won bronze medal in the 3 meter springboard and coached Bob Webster and Greg Louganis to their Olympic medals. In terms of his medical career, he studied pre-med at Occidental College followed his MD from University of Southern California (USC) Medical School in 1947. He than went on to become an ear, nose and throat specialist.